On Monday, January 14th, I received the opportunity to meet Martha Raddatz, ABC News’ Chief Global Affairs Correspondent as part of the Lesher Speaker Series, which has previously hosted speakers like former FBI Director James Comey and author Dr.Jean Twenge, at the Lesher Foundation for the Arts. Along with me were two other journalism students from local high schools who also received the opportunity to introduce and moderate a Q&A session for Raddatz. In preparation for the event, we had spent the previous week meeting directors from the Dean and Margaret Lesher Foundation, a foundation whose mission is to identify programs and projects that reflect excellent service and provide grants to these programs. During these meetings, we went over our roles, where I learned that I would lead Raddatz in an interactive session where she would have the opportunity to answer the audience’s questions about journalism, our political landscape, and predictions that she or other correspondents had for the future of our country. The day of the event, we were taken backstage to run through the logistics of the evening. After meeting Raddatz and receiving the opportunity to ask her our personal questions about journalism and her career, we would then meet The Delta Veterans Group, a nonprofit partner of the foundation, before finally head backstage to listen to Raddatz’s presentation before we would moderate the Q&A Session. Our meeting with Martha was certainly one of the most amazing experiences that I’ve had. From watching the news and hearing about Raddatz in the media, it was hard not to idolize her and forget the she was just like us–like any journalist who had the same goal: to reveal truth in the most fair and accurate method possible in order to preserve the democracy of our nation. I personally asked Raddatz about her past as a war correspondent and the emotional and mental bifurcation that she would’ve needed to adopt when reporting about the atrocities of war. Ultimately, Raddatz reminded me that although journalism is inherently objective, it was still important to remember that it was okay to be human while reporting. You were allowed to have feelings and hold emotion even as you wrote. This resonated with me, since I also like to report about subjects that were emotionally charging and held a significant weight in the eyes of the public. Besides this, Raddatz told us about how she got started in the field of journalism. It turns out that Raddatz never imagined that she would become a reporter. She had dropped out of college, but soon after, she had gotten a job at a news station that her mother worked out. After having her work recognized, Raddatz eventually became a war correspondent and later, ABC’s senior national security correspondent where she exclusively reported from Iraq. After several years of work as a national security correspondent, Raddatz became the network’s senior global affairs correspondent. After we talked with Raddatz and scored some great photos with her, we briefly met with the east bay chapter of The Delta Veterans Group, who were one of the foundation’s nonprofit partners. They were invited to the event since their mission as an organization was to honor and help veterans, similar to what Raddatz’s reporting as a former war correspondent had done. Before we knew it, we were backstage and Raddatz had begun her presentation, narrating her best experiences as a reporter, which included almost dying on a fighter jet, and talking about the field of journalism as a whole. She even talked about her personal experiences through traumatic events, such as 9/11, and gave the audience insight into what it was like to balance a demanding workload with family. To close her presentation, Raddatz provided several brief statements that reinforced what journalism meant to her and what she hoped to accomplish through her work: an unbiased, accurate representation of the world around us, driven by the need to question and challenge authority and to ask the right questions. 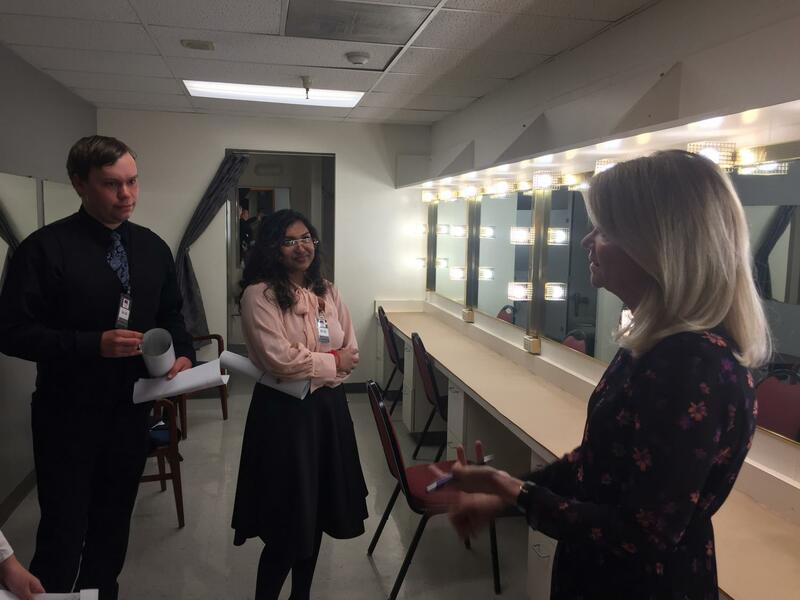 By this time, I had my hands full with questions that the audience had provided and that I had come up with backstage to ask Raddatz. These questions focused on topics anywhere from predictions of national issues to Raddatz’s personal experiences as a journalist and her upcoming work. Before I knew it, the evening was over and I had thanked Raddatz and the team for the wonderful opportunity. As one of the most thrilling experiences that I’ve ever had, I was sure to remember this moment for years to come, especially when I’d pursue a path similar to Raddatz’s in the near future.